Schubert: Schwanengesang; Seidl Lieder | Schwanengesang etc. 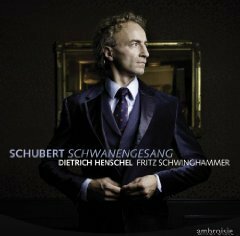 It's a boon to lovers of Lieder when, bus-like, not one but two fine recordings of Schubert's final 'cycle', Schwanengesang, enter the catalogue in quick succession, albeit with various delays due to distribution problems in the UK. From two of the finest interpreters of German song active today, Christoph Prégardien and Dietrich Henschel, the readings are remarkable more for their differences than their similarities. The common ground between both of these new versions can be covered briefly. The native speaker's nuancing of the German language is common to both, as is a questing interpretative intelligence, employed subtly in service of the music and poetry. One of the main differences in their approaches must come in each singer's view of Schwanengesang as cycle. They evidently sit on either side of this particular generic fence: for Henschel, the inner dramatic logic of the songs as published show 'a great theatrical sensibility' that justifies itself and more or less transcends questions of Schubert's own intentions; Prégardien, on the other hand, expands the group to include an additional Rellstab setting at the off – 'Herbst' D.945 – and a handful of additional Seidl songs at the end. With the tenor, then, we have a triptych of Rellstab (eight songs), Heine (six songs) and Seidl (seven songs). Henschel keeps the cycle seperate and adds before it a handful of songs roughly addressing man's relationship with heaven and the afterlife: 'Prometheus' and 'Ganymed' (both Goethe); 'Freiwilliges Versinken' (Mayrhofer); and two Schiller settings, 'Gruppe aus dem Tartarus' and the too-seldom-heard 'Elysium' D.584. One more significant difference comes in the form of the accompaniments. Partnering Henschel, Fritz Schwinghammer is very fine indeed, his playing highly responsive, imaginative and beautifully characterised. However, in my view, Andreas Staier for Prégardien is not only even more imaginative but conjures up one moment of magic after another on his copy of a Graf fortepiano. The timbral effects he produces make for an enormous variety that captures the frequent, subtle descriptive elements of Schubert's writing better than I've heard in a long time. On a purely sensual level, meanwhile, the actual sound – particularly when the instrument is muted – is irresistibly seductive, often surrounded by a mysterious, hazy ambience that is eradicated by the mechanical precision of the modern piano. Listening to the final three songs on the disc gives a wonderful example of the effects this instrument can produce: we really feel the physical effort of the protagonist's trudging in 'Der Wanderer am Mond', the bell tolls distantly within a foggy sonic landscape in 'Das Zügenglöcklien', while the pianissimo achieved at the close of 'Im Freien' is otherworldly. 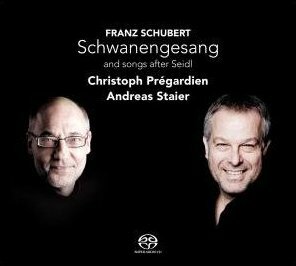 The choice of accompanying instrument with its lighter textures enables Prégardien to sing with disarming lightness and both he and Staier introduce ornamentation judiciously to several of the songs; in the cycle itself 'Frühlingsnacht' and 'Ständchen' benefit particularly. They manage, however, to imbue many of the songs with a gentle, almost classical simplicity but steer clear of any cloying Biedermeier sentimentality. This means that when they get to the dark heart of the cycle – the magnificent Heine settings – the bleakness is even more pronounced, heightening the effect of Prégardien's interpretations which if not as hand-wringingly dramatic as some are every bit as effective within the context as, say, Peter Schreier's chilling rendition with Andràs Schiff. Henschel's approach is very different, yet nonetheless highly persuasive. His voice is, in itself, not a particularly beautiful instrument and can take on a raw character under pressure; it reminds me occasionally of Thomas Quasthoff in its timbre and the fact that it's not produced with constant beauty and sheen across the range. His reading is not one to console the listener with mere vocal niceties; moments of soothing cantilena do not come as easily as they do to Prégardien (listen, for example, to 'Wie hab ich oft so süß geträumt' in 'Kriegers Ahnung') and the voice can dry up and sound tired (as at the end of 'Frühlingsehnsucht'). 'Ständchen' is not particularly seductive and 'Abschied' sounds a little earthbound next to Prégardien's and Staier's beautifully skipping account. However, Henschel creates an authority of his own through the integrity of his interpretations and through an almost aristocratic, objective style. When he reaches the Heine settings he conjures up the fear and bleakness with an economy of means that is hugely effective and in 'Der Doppelgänger' he and Schwinghammer gauge the subtle shifts of tempo particularly well to ratchet up the tension. I look forward to returning to both of these recordings, which capture two wonderful singers in contrasting interpretations of these great, final songs by Schubert. If Prégardien and Staier produce a reading that's little short of revelatory (captured beautifully in SACD sound by Challenge Classics), Henschel shows how there's still mileage in a more traditional approach.